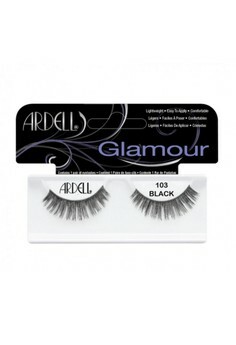 Ardell Fashion lashes #103 are made from 100% sterilized human hair. These natural looking false eyelashes have a full blunt cut. This full style is available in black only. 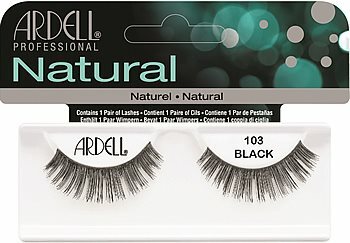 Comparable to Ardell Natural Lashes #101 Demi. *New* Black/White Tray (Professional Natural Eyelashes) Packaging. Ardell Lashes Tip: Before you apply, make sure all oil is off your eyelids. Try using a oil free facewash or astringent toner with cotton ball to remove all trace of oil after cleansing. False lashes need to look as natural as possible. When applied correctly they can help achieve beautiful lush looking lashes. To start the process you have to apply the adhesive first. Apply quality adhesive such as DUO Brush On Striplash Adhesive (0.18oz) along the rim of the false eyelash for look closest to perfection. Let it air dry for about 20 seconds for the adhesive to get tacky so you don't end up with a mess of extra running glue on the skin of the eye or over the false eyelashes. 2. Align your #103 Ardell false lashes gently to cover over your natural lashes and gently press them together. Make sure not to put mascara on your natural lash beforehand. 3. Once done you can apply mascara on your lashes but do it from underneath your natural lashes only by wiggling the lashes. Then go back and gently press them again. The mascara should help blend in your natural and false lashes seamlessly. 4. Then touch up the lashes again if needed with more mascara until you get the look you desire.